When ordering parts, don’t confuse 4 Mb (megabits = 512 kB) with 4 MB (megabytes = 32 Mb). Most manufacturers of flash will specify the bits number, so the part you want will have a 32 (for Mb) somewhere in its name. With the price of flash being even cheaper than the cost of the ESP-01s that are cluttering up your junk drawer, you’ve got very little to lose by giving it a try. You even can have 16mBytes by using 25Q128. How do you store 16mBytes? That’d be 128mbits or 0.128 bits. I’m hoping MicroPython aims a LOT higher than fractions of a binary digit! Just noticed my esp-201 “clone” has a Berg Micro flash chip BG 25Q80A SICG – 1550, which is claimed to be an 8Mb chip (1MB) also. 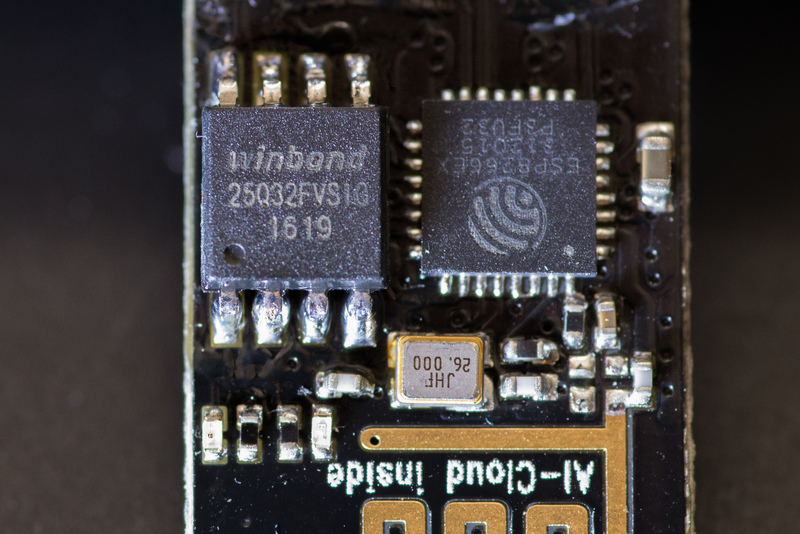 Just noticed my esp-201 “clone” has a Berg Micro flash chip BG 25Q80A SICG – 1550, which is an 8Mb (1MB) chip also. Not sure what the max memory the esp can handle is, ordered some W25Q64FVs and W25Q128FVs. Will try both. Now that is one excellent hack. I have a ready source of 64Mbit spi Flash (Winbond 25Q64FVSIG) scavenged from discarded prototype boards. Thus, when I started using the ESP-12 (which has a tin shield) on projects, it was a natural to swap out the flash. I don’t have an immediate need for the 8MB of flash, but it is comforting knowing the added capacity is there. It’s good to know I can use the 25Q64 SOP8 chips I purchased to replace the Lattepanda firmware chip, now that I returned the LP piece of junk for refund those 25Q64 chips need a home! I had to laugh when I read about 512 MB being insufficient for a µC. That’s twice as much as my first desktop PC had! It’s 512 kB, not mB. He’s talking about 512MB, not mB. Correction; yes, ‘m’ and ‘M’ means micro and mega but you can’t have microbits. M=mega (1E6), m=mili (1E-3), u=(1E-6). Well “u” is just representation for real sign greek letter “μ” for easier/faster writing on standard keyboard. My OCD brain says no, it’s actually KB and MB in upper case. A toe core rect probably. Screw these millennials and their nonsensical units, poor work ethic, and flat user interfaces! My KB will always have 1024 bytes in them, just like every computer still does. No. K is never K, always k. To differentiate between binary and decimal powers you use kB and kiB. Intel SDK-80: 8080 Processor with 256bytes RAM, later upgraded to 1024bytes via a 2102 RAM chip. Connected to outside world via Teletype with punch cards and paper tape. Still working, with original documentation from Intel. Got a Trash-80 too. Serial # 0000111. I have to agree that people needing more than 512 MB for micro hurts my head. Think about the Commodore 64, Apple II line, and the Atari line of computers as well as all the CPM machines. Heck my Amiga 1000 only had 512k until I had and Starboard with 2MB on it. Lots of memory is good but my gosh has it gotten big and cheap. Most of the flash will be used as “hard drive” to store files. And your 512k computer had an ethernet+ip-stack? wifi/wpa2-support? Access point functions? Some sort of rich real time multi tasking os? The thing here is that they are not programmed in python or similar script languages. Because today’s computers have so much memory and speed, people get lazy, so we need a lot of kilobytes of flash and few megahertz just to blink a led. I could understand this if he was flashing less but it appears, at least from his other videos, that the intention is to program robots without needing to connect a USB cable to it. In the video previous to this one he described using pogo pins to program one of his other projects, and while it worked it was a pain because disassembly was required. It makes you wonder what is using up all that memory. We’ve written a couple articles on it recently. You’ll want to type “micropython” into the search bar. Just about any dead (or otherwise) UEFI based computer will have a pretty substantial SPI EEPROM on the motherboard. EEPROM isn’t the same thing as Flash. meh….. The chips you are looking for can be readily harvested from motherboards. A valuable thing to remember here is that there are different “SOIC” packages – JEDEC and EIAJ versions. So SOIC isn’t actually enough for a concrete footprint specification. Pin-bending, bodgy-soldering hacking is possible, but for a professional look, if you’re fabbing boards, it pays to check first. Although the smaller devices (e.g. 8kb on the older ESP-01 modules) are usually the smaller, more common 8-pin JEDEC SOIC, the larger flash chips (e.g. 32Mb) are usually the larger (EIAJ) package. It’s a really nice and good hack. But I really miss the credits for the creator of the video? Why is the name of Andreas Spiess not listed?